It was a sequel seven years in the making and at the time it had been the most expensive film made to date. The visual effects surpassed everyone's expectations and when it was released on July 3, 1991, it became an instant commercial and critical success. It utilized the latest CGI technology offering audiences something they had rarely seen before and changed the original story that viewers loved in 1984. The second installment in the Terminator series lived up to the original and them some and delighted fans of the first film. Twenty-six years later Terminator 2: Judgment Day once again uses the latest that technology has to offer as it is released on 4K Blu-ray this holiday season. As the film opens we see Ten-year-old John Connor (Edward Furlong; American History X) living with a foster family and getting into all kinds of trouble as his mother Sarah (Linda Hamilton; Children of the Corn) is locked up in the psychiatric hospital. She rants and raves about robots from the future coming to kill her son but nobody believes her. Then one day John shows up at the hospital with the Terminator (Arnold Schwarzenegger; True Lies) sending Sarah into a panic, as she is afraid the Terminator will kill John. Unfortunately, he isn't the one they need to worry about. It turns out the Terminator has been reprogrammed to help keep John alive as a new, updated threat, The T-1000 (Robert Patrick; The Faculty) has been sent back into time to kill him. The T-1000 is much more advanced and can morph into mimicking other people. It can turn from a solid to a liquid state making it easier to track and hunt down John in an attempt to kill him long before John becomes the leader of the resistance. The terminator is arguably Schwarzenegger's most recognizable and iconic role as he is well suited to the task of playing a robot from the future. It also gave us some memorable lines and this second film gave us the well-known, "Hasta La Vista Baby" phrase. Hamilton is also remembered for her portrayal of Sarah Connor and the second film in the series saw her in more muscular shape than the first one. This transformation helped make her a believable action star. Furlong was a newcomer to movies but he did a good job for someone without any experience. Patrick also made a lasting impression in his role that has served him for many years. The 4K resolution presented in 2160p quality is excellent and really showcases the CGI work this film is known for. The morphing T-1000 graphics are superb and the picture quality is top notch. Unfortunately, the DTS- HD master audio 5.1 doesn't live up to the same high standards as the video. While the video has been redone for this release, the audio could have benefited from a Dolby Atmos upgrade. This is truly disappointing, as this would have made this one of the "most purchased" discs during this holiday season. The Combo pack offers a brand new 55 minute extra entitled Reprogramming, which features candid interviews with cast and crew, terminator lore, and production aspects of the film from start to finish. Also brand new is a trailer for the 2017 3D re-release of the film. Aside from this feature, all the old featurettes from the last round of Blu-ray releases of the film are also included: A 1993 documentary of the making of the film, deleted scenes, and original trailers. Fans who thought they would only get the theatrical edition of the film will be in for a pleasant surprise as the Blu-ray disc contained in this release has the theatrical, special edition and extended special edition available via seamless branching. This iconic series solidified Schwarzenegger as an action star of the 1990's and helped in making him a household name. With a unique premise, it also offered audiences something new to enjoy and switching up the second film by making the former bad guy the hero this time was a genius move on the writers and producers part. It kept the series fresh and interesting instead of offering the same recycled storyline we had already seen. Fans of the series will want to get this movie in its most updated form to keep and watch for years to come. The film gets an A+ but this release only gets an A- due to the audio issues. 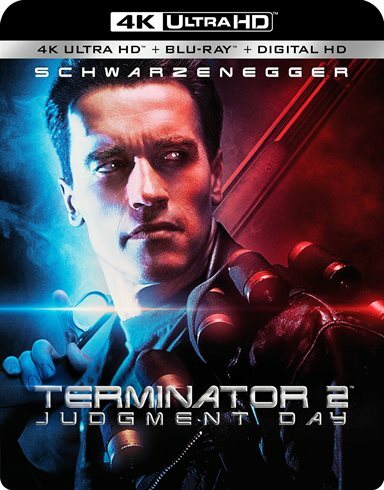 Download Terminator 2: Judgment Day from the iTunes Store in Digial HD. For more information about Terminator 2: Judgment Day visit the FlickDirect Movie Database.